Doc cleared me to begin strengthening on Wednesday. At my PT session on Friday, my therapist started me out doing bicep and tricep curls. I'm starting out with a laughable 2-lbs! Now I've seen 2-lb barbells at the store before. And wondered, 2lbs? Why bother? 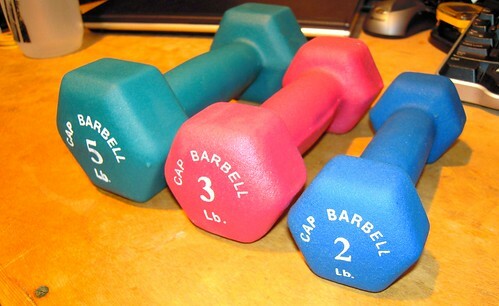 Now... 12 reps at 2-lbs is a full workout. I can't get do more than about 3 reps with a 3-pounder. Oh.. how I've fallen. I'll progress to 3-lb then 5-lb and so on.